Hide your nuts! 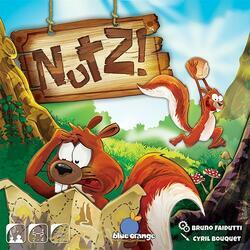 In this game of bluffing and strategy, you play as squirrels that prepare the winter. You hide your supplies in the trees in summer and you will try to achieve the best harvest in winter. But beware, the forest is full of traps and other squirrels use the same shoals as you. Worse, they sometimes get busy at night so you can not see the nature of their spoils. Nutz is a game full of twists where you will try to score a maximum of points through di erent collections while dodging the penalties and traps of your opponents.